One of the key tech trends with cars is that the ‘elite’ features usually found in luxury vehicles has trickled down to everyday passenger cars that are more affordable. Lane-keeping tech, adaptive cruise, and even blind spot monitoring were reserved for the upper echelon only, those who could afford a Mercedes-Benz, a BMW, or an Audi. Ford started the break the mold when it introduced automated parking to the Focus, and even the 2019 Ford Fiesta – at a price of only $14,260 (about £11,000, AU$20,000) – now has lane-keeping tech. 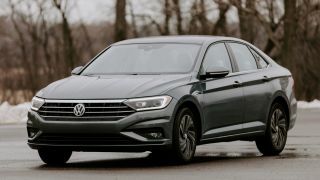 The best recent example of that is the 2019 VW Jetta, a mid-sized sedan that costs $18,545 (about £14,000, AU$26,000) and went through a redesign recently. A new Digital Cockpit borrows heavily from the Audi brand (which is part of VW). It’s a 10-inch display above the steering wheel, showing your speed, trip info, and other info typically found in this location, but allows you to customize what you can see using the View button on the steering wheel, switching to a digital readout for RPMs and speed, or showing a massive navigation map to help you find your destination. Audi goes a major step further with a similar display. In the A4, for example, you can see a Google Earth map that shows the terrain around you as you drive, helping you spot a lake off in the distance or track the edges of a mountain range. Nothing quite like that here, but the Digital Cockpit is a safety feature as much as a digital age perk. You can focus on the road ahead of you instead of glancing over at the center display, which can be distracting. What’s most interesting to me about the Digital Cockpit is that these customizations are going to become more and more common, and we’re going to see more and more extra displays in cars. In reviewing the 2019 Subaru Ascent recently, that was my first discovery: that there are four different screens in the car available to the driver, including the digital rear-view. The Jetta lets you customize the interior color, picking from 10 hues. You can also set the driver preferences for seat position and even climate control, save them under your own username and reactivate the settings in one click when you first jump in. In the near future, we might personalize things much further. Once we have multiple screens, we might decide to always show a camera view behind us, or choose one display that always shows your current music selection (along with a picture of the artist). I could even see using a dedicated screen for showing a real-time camera pointing toward the back to keep an eye on the kids. And, for a vehicle that can pull cargo, a view of the trailer you’re towing. The driver is king or queen, and in the future, we’ll be able to customize every display to our own preferences – or disable them and just focus on the road ahead.